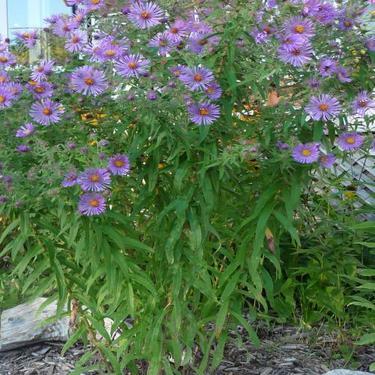 Considered an aggressive weed by some people, the New England aster is prized for its attractive flowers. It is very popular for bees collecting nectar and Monarch butterflies are attracted to the flower of this plant as it provides an important source of late season nectar. Interestingly, the flower of this plant was used in a love medicine by the Iroquois (First Nations). The New England aster blooms from August to October and grows in abundance adding vibrant colour to the autumn landscape. In home gardens it grows best in sunny locations. 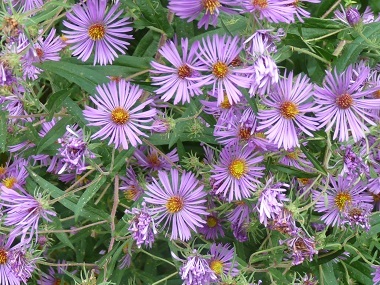 Distinguishing Features: New England asters have large rose-purple flowers, with numerous rays. 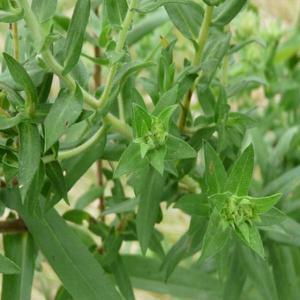 It has clasping leaves and a rough stem that has several branches reaching out. Flowers: Large rose-purple flowers with numerous rays. The centre of the flower is yellow. Flower heads cluster at the ends of the branches 2-5 cm wide, consisting of 50-75 flowers. 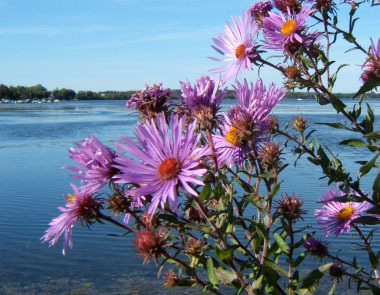 Fields of Nutrition has medicinal benefits and vitamin/mineral content of New England Aster. Leaves: Clasping leaves and a rough stem. The aster plant has three prominent veins. Lower leaves have usually disappeared by flowering time. Leaves are toothless. Height: Grows to an average height of 120 cm but can get as tall as 2 metres. Habitat: Open areas, wet thickets, swamps, and fields all over Ontario and most of Canada and in the U.S. Edible parts: The root has been used for centuries in Chinese medicines. The flower and leaves are also reported to provide health benefits. Flowers can be eaten fresh and added to a salad as can the leaves. When harvesting in September or early October be sure the plant is dry (dew is gone) and cut stem about 10 cm above the ground. Hang upside down in a cool, dark location until totally dried (crumbles easily). Most of the flowers will become white and fluffy but they can still be used. Add dried plant to salads, main dishes or make a cup of tea. 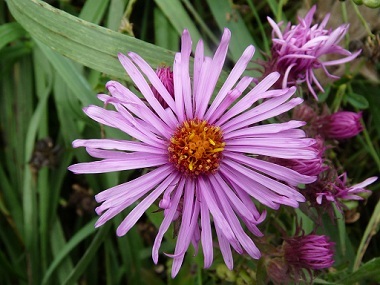 Similar plants: Amethyst Aster, Purple-Stemmed Aster.